Offering you a complete choice of products which include textile softener and silicone softener. 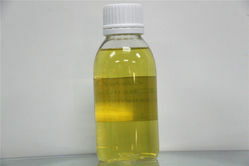 A Textile softener (recently called textile conditioner by some producers for marketing purposes) is a chemical compound that is typically applied to laundry during the rinse cycle in a washing machine. Silicone softener is for use in textile: silicone-basedsofteners are used for both natural, synthetic fibers and their blends. It provides a soft, lofty and slippery touch to the material. It imparts excellent drape, softness, bulkiness and rich feel to more. Looking for Textile Softener ?